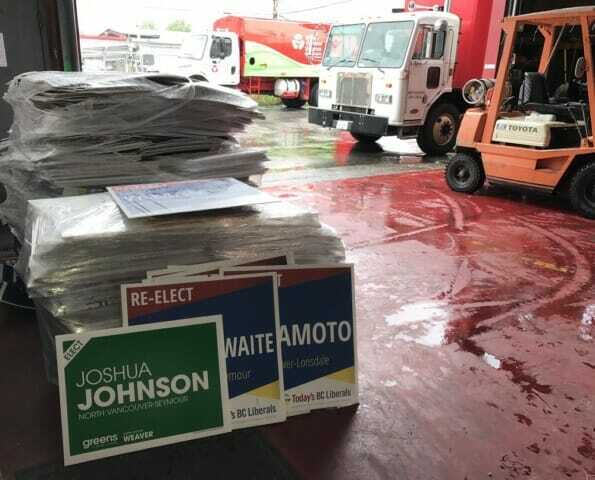 Following the May 9th BC Provincial Election, WCS ran a campaign to collect soft plastic and coroplast political candidate signs for recycling. 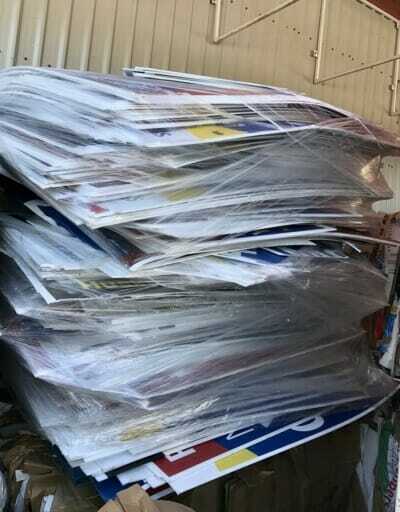 Candidate party offices and residents dropped-off almost 1000 pounds of signage for recycling at our North Van location. Sign drop-off was by donation and as a result $50 was raised for the North Vancouver Harvest Project! The soft plastic signs collected by WCS are baled and sent to downstream partners in the Lower Mainland. These facilities organize the collection and distribution of the material in large volumes to manufacturers. The used soft plastic is then recycled into new plastic bags by manufacturers. Coroplast election signs are made out of a hard polypropylene plastic. From our North Van depot, the signs are also transported to downstream partners which either process the material on site or re-sell it to be shredded, cleaned, and then made into resin pellets. Those pellets are used to make new plastic products such as planter pots, soft plastic bags, outdoor plastic decking, and other poly propylene plastic products. If not recycled, soft plastic and hard plastic materials have an incredibly long life, taking hundreds of years to break down. Much of it eventually ends up in our oceans, negatively impacting animal and plant life. Pictured below are many of the signs we were able to divert from landfill and which will now be recycled! I have nowhere in the Cariboo to recycle 350 lawn signs. Where is the closest place to do that?